Efflatounaria Efflatounaria - Sanjay's purple Efflatounaria - best color under reflected VHO lighting, seems to be hardy. Originally from Sanjay J.
Clavularia sp. 'Liam's Papaya Clavularia. Grows quickly. Polyps are small under strong light. Maintains bright contrasting green and gold irridecent polyps under a wide variety of lighting conditions. Hardy. Closeup photo of a single polyp. 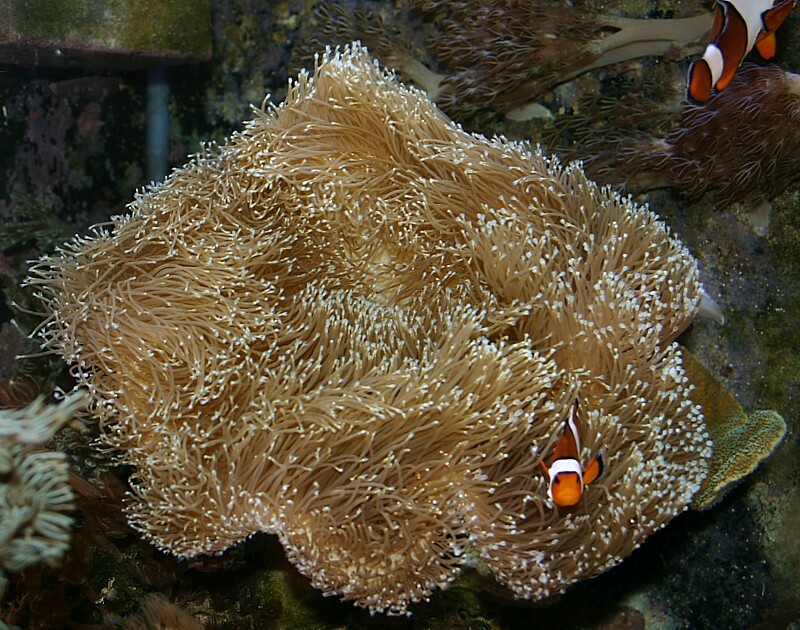 Polyps are about 1/2 inch in diameter. Nephthea sp. Green tree coral. Very fast growing and hardy. Originally from Ultimate Reef in NH (shop now closed). Cuttings were recently taken from the base of the colony in the picture. Sinularia sp. Green tree coral. These branches are more finely tapering. A newer addition - seems to be fast growing. Originally from Warren G. Sorry the focus is off in the photo - it is indeed different from the Nephthea. Sinularia sp. Screaming green tree coral. A new morph! The brightest green tree I've ever seen. Slow growing, and polyps typically do not extend significantly. Klyxum sp. 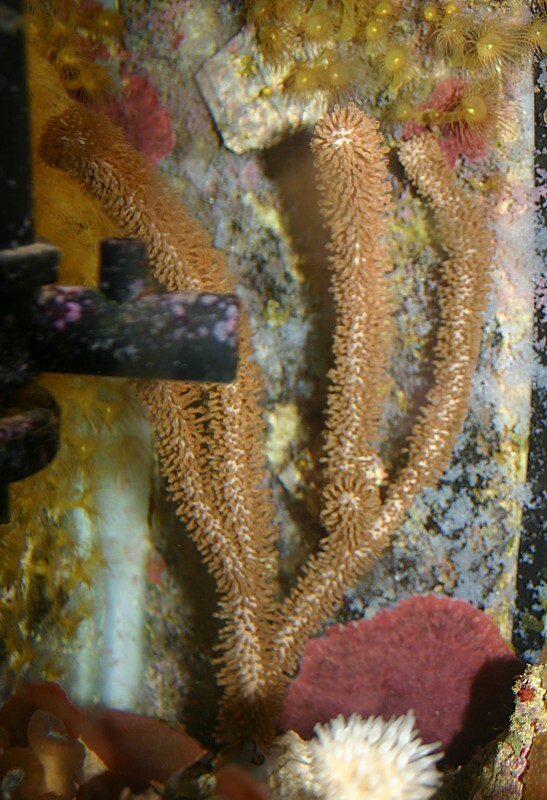 Alcyonium, colt coral. Brown, fast growing. Originally from Randy H-F.
Capnella sp. Brown tree coral. Brown and very fast growing under some conditions. Drops babies often. AKA Kenya tree coral. Anthelia sp. Waving hand coral, white and brown with long polyps. Fast growing under some conditions, does well even under low light. The polyps sometimes grow very large. Originally from Little Shop of Pets, NH. A pic of my A. ocellaris clowns playing in the Anthelia (same species as above photo). Xenia sp. White, with short stalks. From Mike A., MA. Xenia elongata(?) Brown pulsing xenia. 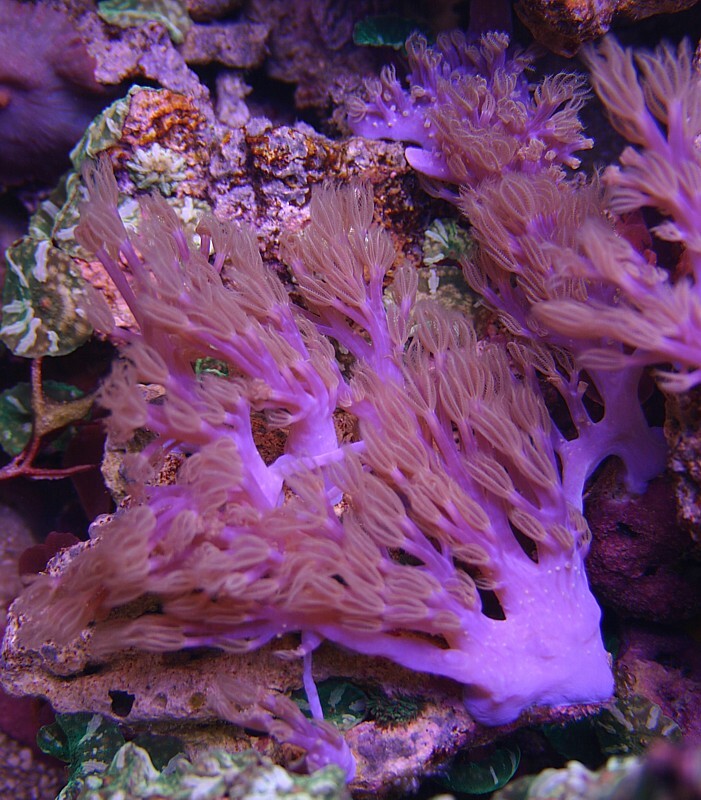 Polyps sometimes on very long 'stems'. Originally from Inland Reef Aquaria, NH. > Pterogorgia sp.(?) Brown photosynthetic gorgonian with thin branches. Pseudoplexaura sp.(?) Purplish photosynthetic gorgonian with very large feathery white/brown polyps. Originally from Honduras. > Sarcophyton elegans Sarcophyton or mushroom leather coral. This bright yellow S. elegans (Fiji leather) is sensitive to propagation and damage. It requires moderate to bright light. Sarcophyton sp. Solomon Islands brown Sarcophyton. Fast-growing and easy to propagate, this mushroom leather forms zillions of long polyps that move with the current. My clowns love to play in the colony. This colony grew from a piece the size of my pinky in 3 years. > Alcyonium (?) 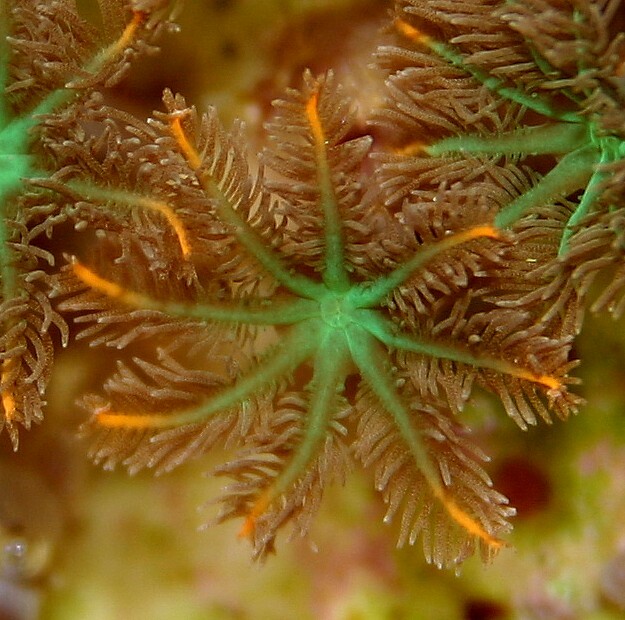 Green colt coral. Easy to propagate. Originally from local LFS. Heliopora coerulea Blue ridge coral. Brown tissue over a blue skeleton. This coral likes to encrust a lot. 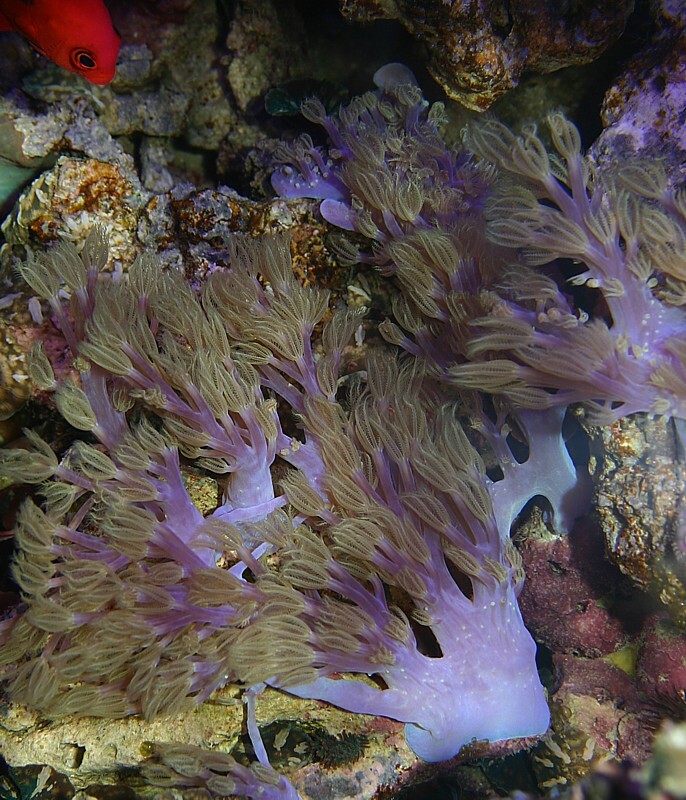 The polyps only extend occasionally, and sometimes the coral sheds waxy surface. Originally from FFExpress.